Today in What's that Sound? we're discussing a Benjamin Franklin original production; the armonica. The armonica, also known as the glass harmonica, was Franklin's reimagining of the singing water glasses. Ben had seen a performance with musical water glasses while living in England and really enjoyed the sound, but thought the set up and tuning of the glasses seemed like a lot of work. Being a man who always liked making life a little easier, he moved some parts around and made a new instrument that improved upon the original concept. With the armonica, the glasses were always in place and perfectly tuned; and now you could even play up to ten glasses at a time. Booyah! An armonica consists of 37 glass bowls that are aligned horizontally on a spindle and gradually decrease in size. The spindle is turned using a foot pedal. The musician wets his or her fingers in a bowl of water and touches the rims of the spinning glasses to play the notes. The quality of the sound is thought to be slightly disorienting because of the way humans perceive and locate sound. There are certain sound ranges that make it difficult for our brains to figure out what is causing a noise or locate where the noise is coming from. An armonica's sound range (1-4 kHz) just happens to fall in this "Huh? What? I don't get it?!" range. The armonica's popularity began waning by the end of the 18th century. Perhaps it was the rumors surrounding the instrument that brought about its demise. Some claimed that armonica musicians were driven mad by the sound and "excessive nerve stimulation" from playing. More modern interpretations of the rumor believe it was lead poisoning from the lead glass used to make the spinning bowls. But that's all conjecture and there's no real evidence that any of it is true. It's possible that, as with any musical fad, tastes simply changed. Nowadays, the armonica, sans lead, makes rare appearances in concert music. Only a handful of master players continue to perform the instrument, including fake Ben Franklin seen above, aka William Zeitler. So what's that sound? Now you know! This week in What's that Sound? we're taking a look at the pump organ, also known as the harmonium. In Europe, early iterations of the harmonium came about as early as 1780, and as the instrument spread to the US, it peaked in popularity in the 19th and 20th centuries. Originally harmoniums were used in churches as a smaller and cheaper alternative to the pipe organ. They were stand-alone instruments with a foot pedal to control the bellows as both hands played the keys. It wasn't until the instrument was introduced in India that it became the handheld version that is most commonly used today (and illustrated here). 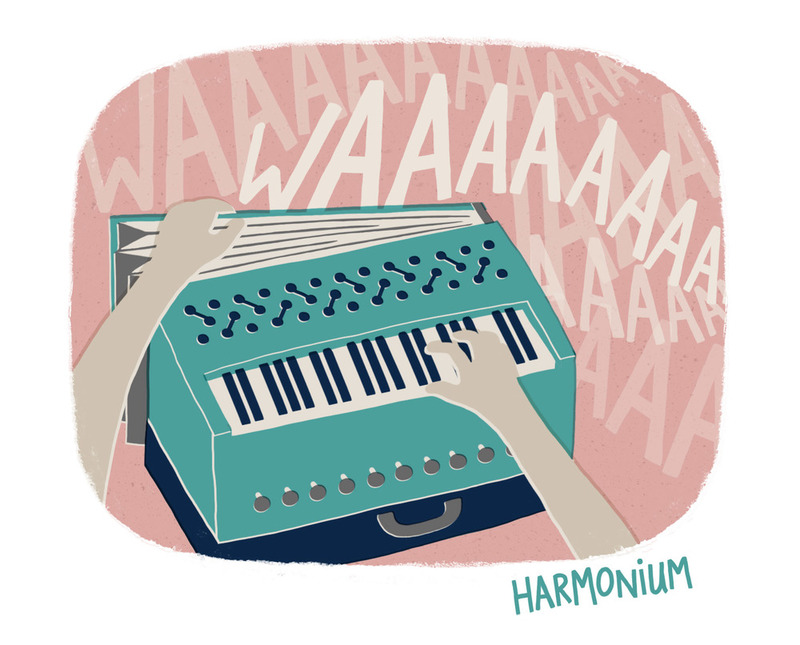 It wouldn't look like it from the outside, but the harmonium is actually a reed instrument. Air is pumped into the harmonium using external and internal (unseen) bellows. Opening and closing the stops determines which chambers the air is allowed to move through and which bank of reeds are activated. This distinguishes the "voice" of the instrument and can create the layered effect of the sound. Fun Fact :: the phrase "pulling out all the stops" refers to organ stops. When all the stops are pulled out the organ plays all variations of that sound at once, thus being the loudest possible. By the 1930s, with the development of the electric organ, the reign of the harmonium in the West was basically over. (Although its distant cousin, the accordion, continued to thrive.) But this instrument still remains extremely important in genres of Indian music and helps give it the distinct sound we recognize. Harmoniums still pop up in Western music. You can hear them featured in a number of songs by the Beatles, including We Can Work It Out and Being for the Benefit of Mr. Kite. More recently, Sharon Van Etten used a harmonium to layer beautifully with her vocals in her song D sharp G.
This week I've been reminiscing about my trip to the Neon Museum this past summer which left me with plenty of inspiration. I've been trying to funnel that inspiration into a set of greeting cards based off of vintage lighted signs. They've been a struggle for some reason and I think I need to stop looking at them for a bit. Maybe my eyes just need a breaking from the eye-bleeding color. Developing Monster Bash :: While researching a project I have percolating in my brain, I came across this amazing blog post from the Professional & Amateur Pinball Association (PAPA) about the making of the Monster Bash pinball machine. Incredible sketches, notes and production photos abound. Maurice Sendak talks with Studs Terkel :: Brain Pickings featured a forgotten conversation between my hero, Maurice Sendak, and Studs Terkel. Sendak's comments on piecing together fragments of creativity resonated with me the most. I'm starting a new series called What's that Sound? about obscure and lesser-known musical instruments. Sure, there's your average piano or trumpet, but what other musical voices are out there? First up, we have the otherworldly electric theremin. The theremin was developed in the 20's by Leon Theremin, a Russian inventor. Theremin was actually trying to build a proximity sensor for the Russian government but ended up creating what is considered one of the first electronic musical instruments. It's a tricky instrument to play with few who are considered "masters." One of the most renowned theremin players is Clara Rockmore, who can be heard here playing La Vie en Rose like a boss. The recent snow dump we had is making me crave warmth and flowers. Here's looking forward to 2016. Lately I've been starting fresh; as a freelance designer, as a work-from-home hermit, as an all day bunny rabbit wrangler. So far I've forgone the stretchy pants and vegging out and continue to keep myself busy. With the Printsource show coming up in January, I've been working on prints for Cherry Design Partners. Once the show opens I'll share some of my favorite prints that I developed. My work space is slowly coming together and I've got ideas brewing of projects and things I want to begin after the New Year. I think this fresh start is coming along nicely.